"From the Texas Revolution, Texas Independence, Republic of Texas, Texas Annexation, Texas Statehood, to Texas Timeline..."
The recorded History of Texas begins with the arrival of the first Spanish conquistadors (conquerors) in the region now known as Texas in 1519, who found the region populated by numerous Native American tribes. Their ancestors had been there for thousands of years. 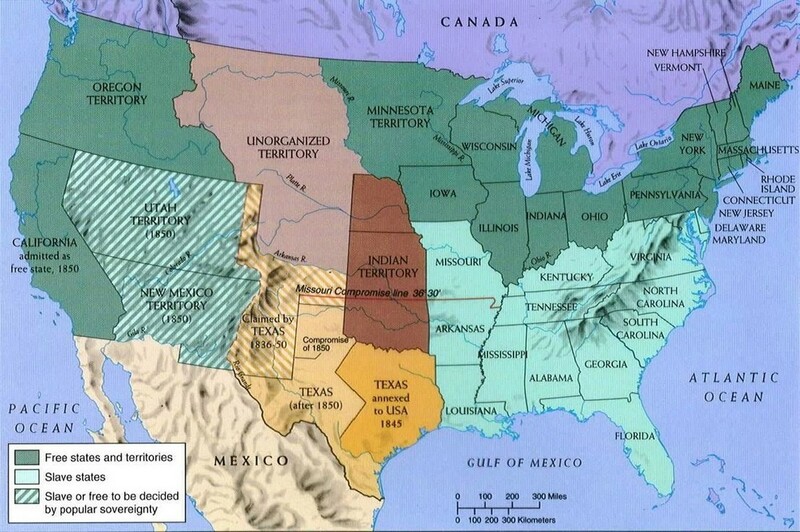 During the period from 1519 to 1848, all or parts of Texas were claimed by six countries: France, Spain, Mexico, the Republic of Texas, the United States of America—as well as the Confederate States of America in 1861–65. The first European base was established in 1680 in El Paso, Texas with the exiled Spaniards and Native Americans from the Isleta Pueblo during the Pueblo Revolt, also known as Popé's Rebellion, from northern New Mexico. In 1682, René-Robert Cavelier, Sieur de La Salle established a French colony, Fort Saint Louis, near Matagorda Bay. The colony was killed off by Native Americans after three years, but Spanish authorities felt pressed to establish settlements to keep their claim to the land. Several missions were established in East Texas; they were abandoned in 1691. Twenty years later, concerned with the French presence in neighboring Louisiana, Spanish authorities again tried to colonize Texas. Over the next 110 years, Spain established numerous villages, presidios, and missions in the province. A small number of Spanish settlers arrived, in addition to missionaries and soldiers. Spain signed agreements with colonizers from the United States. When Mexico won its independence from Spain in 1821, Mexican Texas was part of the new nation. To encourage settlement, Mexican authorities allowed organized immigration from the United States, and by 1834, over 30,000 Anglos lived in Texas, compared to 7,800 Mexicans. After Santa Anna's dissolution of the Constitution of 1824, issues such as lack of access to courts, the militarization of the region's government (e.g., response to Saltillo-Monclova problem), and self-defense issues resulting in the confrontation in Gonzales, public sentiment in Mexican Texas turned towards revolution. Santa Anna's invasion of the territory after putting down the rebellion in Zacatecas provoked the conflict of 1836. 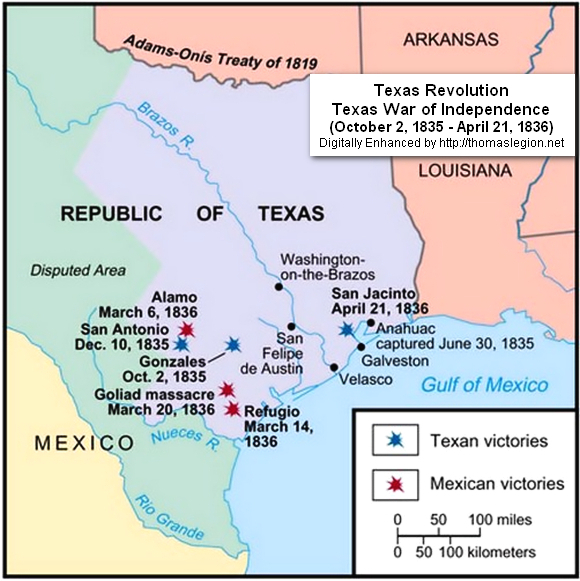 The Texian forces fought and won the Texas Revolution in 1835–36. Texas became an independent nation, the Republic of Texas. Attracted by the rich lands for cotton plantations and ranching, tens of thousands of immigrants arrived from the U.S. and from Germany as well. In 1845, Texas joined the United States, becoming the 28th state. Texas declared its secession from the United States in 1861 to join the Confederate States of America. Although only a few battles of the American Civil War were fought in Texas, most Texas regiments served in the east and in the Army of Northern Virginia. When the war ended, Texas was under Military Law and subject to Reconstruction. After Texas's annexation, Mexico broke diplomatic relations with the United States. While the United States claimed that Texas's border stretched to the Rio Grande, Mexico claimed it was the Nueces River. While the former Republic of Texas could not enforce its border claims, the United States had the military strength and the political will to do so. President Polk ordered General Zachary Taylor south to the Rio Grande on January 13, 1846. A few months later Mexican troops routed an American cavalry patrol in the disputed area in the Thornton Affair starting the Mexican American War. The first battles of the war were fought in Texas: the Siege of Fort Texas, Battle of Palo Alto and Battle of Resaca de la Palma. 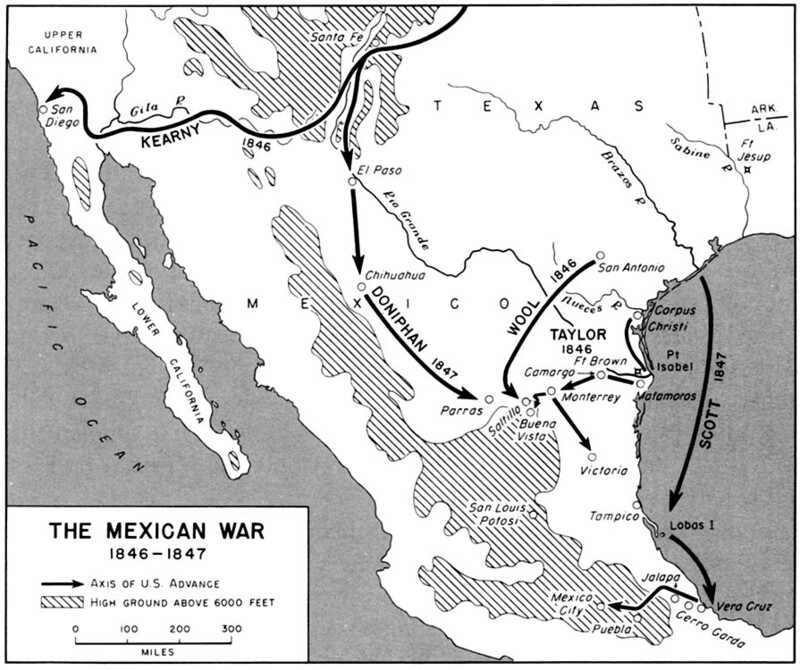 After these decisive victories, the United States invaded Mexican territory ending the fighting in Texas. After a series of United States victories, the Treaty of Guadalupe Hidalgo ended the two-year war. In return, for $18,250,000, Mexico gave the U.S. undisputed control of Texas, ceded the Mexican Cession in 1848, most of which today is called the American Southwest, and Texas's borders were established at the Rio Grande. 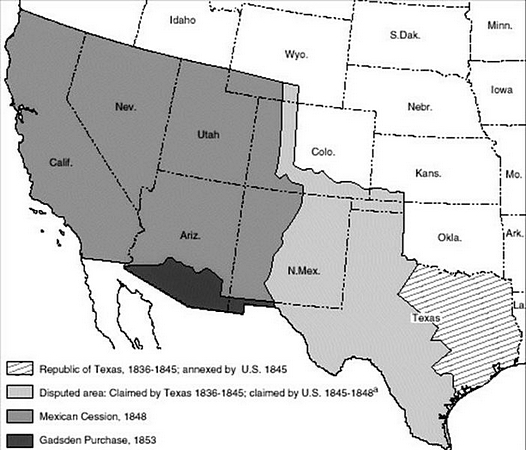 The Compromise of 1850 set Texas's boundaries at their present form. U.S. Senator James Pearce of Maryland drafted the final proposal where Texas ceded its claims to land which later became half of present day New Mexico, a third of Colorado, and small portions of Kansas, Oklahoma, and Wyoming to the federal government, in return for the assumption of $10 million of the old republic's debt. Post-war Texas grew rapidly as migrants poured into the cotton lands of the state. They also brought or purchased enslaved African Americans, whose numbers tripled in the state from 1850 to 1860, from 58,000 to 182,566. Texas is the second most populous (after California) and the second largest of the 50 U.S. states (after Alaska) in the United States of America, and the largest state in the 48 contiguous United States. Geographically located in the south central part of the country, Texas shares an international border with the Mexican states of Chihuahua, Coahuila, Nuevo León, and Tamaulipas to the south and borders the U.S. states of New Mexico to the west, Oklahoma to the north, Arkansas to the northeast, and Louisiana to the east. Texas has an area of 268,820 square miles and a growing population of over 26.4 million residents (July 2013). One Texas industry that thrived after the Civil War was cattle. Due to its long history as a center of the industry, Texas is associated with the image of the cowboy. The state's economic fortunes changed in the early 20th century, when oil discoveries initiated an economic boom in the state. With strong investments in universities, Texas developed a diversified economy and high tech industry in the mid-20th century. As of 2010 it shares the top of the list of the most Fortune 500 companies with California at 57. With a growing base of industry, the state leads in many industries, including agriculture, petrochemicals, energy, computers and electronics, aerospace, and biomedical sciences. Texas has led the nation in export revenue since 2002 and has the second-highest gross state product. Key Words and Related Studies: Texas Timeline History Texas Revolution Texas Independence History of the War for Texas Independence, Battles Timeline Battle, History Texas Map Photos Photographs Pictures, Battle of the Alamo Map, Articles of the Gadsden Purchase with the United States, Year Ratified, Copy of the US Treaty with Mexico, Results, Details, Summary of the History of Texas, Essays, Free Essays of Texas, Battlefields, Results of Mexican War, Where is the Alamo located year of the Battle of the Alamo, History of the Republic of Texas, War of Independence Texas, San Antonio Texas Detailed History, Picture Photograph Photo of the Alamo, Battles, History Timeline of Texas.